Mayor Marty Walsh and BPS interim superintendent Laura Perille during a meeting with the Globe editorial board on June 28. 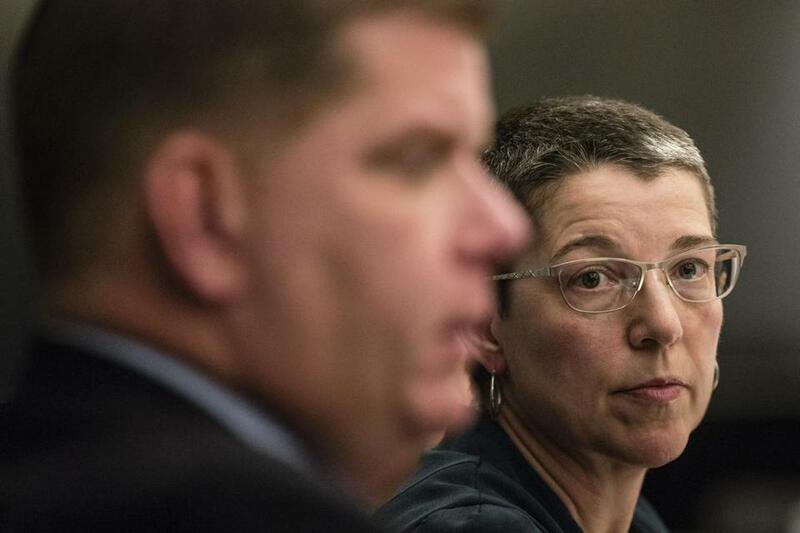 Laura Perille has barely started as interim superintendent of the Boston Public Schools, but her support in some parts of the community is already crumbling. On Wednesday, a group of civil rights, parent, and educator groups fired off a letter demanding that Perille be banned from seeking the permanent post. The critics, which include the Boston NAACP and the Boston Network of Black Student Achievement, fear that qualified external candidates won’t be interested in applying for the permanent job if Perille is in the mix, because she’ll be perceived as the automatic front-runner. The opposition to Perille — who hasn’t said publicly whether she wants the permanent job — is premature. Perille should not have an inside track on the permanent position, but if she turns out to be a good interim superintendent, the city would regret eliminating her out of hand. Still, the anxiety about Perille stems from legitimate beefs. Walsh didn’t do Perille any favors when he picked her two months ago with no input from the community, after unceremoniously dumping superintendent Tommy Chang. Frankly, the way the last superintendent was run out of town is likely to be a bigger obstacle to attracting candidates. And if the mayor who just undermined the last superintendent publicly rules out Perille, it may not send the message that Perille’s critics think it would: It might instead scare off applicants who would see a pattern. The groups are on surer footing with the rest of their demands. They want a firm timeline to launch the search for a superintendent and for the city to commit to having a permanent leader in place in time for the next school year. Amen to that. Walsh and the school committee have been mum on when the formal process to choose a superintendent will begin, and no search committee has been formed. Perille isn’t the problem. The city needs an open search for a permanent superintendent, and it should get started soon. This editorial has been updated to include Mayor Walsh’s comments.